The Irish Elk already is devising his litmus test for the 2012 presidential candidates. At this point few appear to suit. America's role in world: Point of pride, or cause for apology? 9/11: Remember it or forget it? Ayn Rand: Thumbs Up or Thumbs Down? I had been following with interest the prospects of Rep Paul Ryan, R-Wisc. ; it was my hope to see a Catholic rise to the conservative fore, providing an alternative to the reigning evangelical Protestantism of the GOP, and he seemed to be making the case against Obamacare quite well. But it turns out Congressman Ryan is an Ayn Rand acolyte. Red flag! He needs to read his Whittaker Chambers. David Brooks now has floated Sen. John Thune, R-S.D., as potential presidential timber. Wait till Mr Brooks' friends at the NYT get wind of the creationism syllabus at Sen. Thune's alma mater, Biola Bible college. An optimistic view of the presidential prospects of Martin Van Buren, nominated at the Free Soil Party's August 1848 convention in Buffalo, New York. 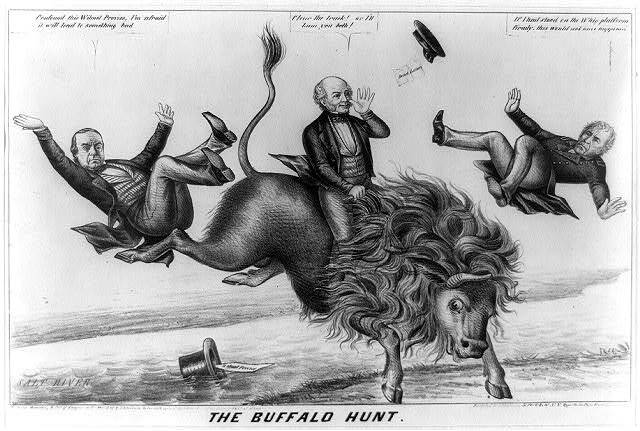 Here Van Buren rides a buffalo and thumbs his nose as he sends Democratic candidate Lewis Cass (left) and Whig Zachary Taylor flying. Both are about to land in Salt River. Van Buren says defiantly, "Clear the track! or I'll Ram you both!"